For a long time now, scholars and academics have all agreed and cemented the opinion that the origin of commerce lies firmly rooted in prehistoric times. Once man slowly but surely made his way out of the primordial soup and started to grunt, cough, scratch and whistle and well, start to communicate with his fellow hairy men, there is the strong belief that he would have also started bartering and trading goods. However, anthropological archaeologists have recently made the startling discovery that these early exchanges of goods quickly developed into a very complex and sophisticated system. And that we, the modern day Homo Sapien have a lot more in common with our ancestors than we realised. In other words, the cavemen were a lot smarter than we thought. Sorry I've been sniffing tippex again. It's just I got this email from a guy who lives in a cave in Orce, Andalucia (from which he also runs an online deli) asking would I like to try some locally produced "Fire Chorizo". The mere word "chorizo" sent me spiralling into a in-cognizant daydream full of dinosaurs, volcanoes and troglodytes chasing cured paprika sausages with spears. And then into my head came the idea of a primitive version of the Internet. I don't know where it comes from, it just pops in there. Still when I finally roused from the stupor and wiped the drool from my chin, I simply typed back "yes, please." The guy in question is called Iain who runs his underground business Orce Serrano Hams with his partner Gayle and I must admit, after a brief exchange of emails, he is doing the kind of thing that most of us can only dream of. The story is great. Originally from Newcastle, they sold up everything, took a caravan down to Spain and spent 6 months renovating a hole in the ground. The idea for the business came from a visit to a tapas bar and seeing all the hams hanging up. In Iain's words he was just "itching to do something different". This all makes me feel ever so jealous and more than a little bit peeved for continually thinking up pie in the sky ideas and never doing anything about it. Damn it! But good on Iain and Gayle though, at least some are living the dream. I have to say that the website for their online deli is very impressive, covering all the bases, it pretty much is a one stop shop for Spanish Cuisine. I don't know that much about the different varieties of Spanish hams so the breakdown listed here was very helpful. The recipes section is quite astounding, very comprehensive so when I feel the need to go all flamenco in the kitchen I will definitely return to get some inspiration and try some out. The chorizo that Iain sent over was the Orce Fire Chorizo and some standard "picante" along with some authentic Andalucian Cave Rock. Now I know what you were trying to do there Iain but if you think I am going to be fooled that this is some Spanish version of our end of pier Brighton candy then you are sorely mistaken. (My dentist's bill is in the post). I was rather excited when the package arrived and nearly set about wolfing up the red devils there and then but in the interests of experimentation, I decided to eek things out over the week. For ideas I put a shout out on twitter and none other than Thomasina Miers came back to me with the suggestion* of chorizo with scrambled eggs, onion, garlic, chilli and coriander. 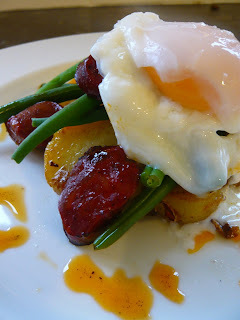 A rather unusually named Mr Nonsensepipe said that chorizo with sauteed potatoes, green beans and poached egg was a winner. And as Iain had also sent over some recommended recipes, I went for the Warming Winter's Brunch, a very traditional Andalucian recipe, typically eaten by farmers during the cold months. All three dishes (or three breakfasts I should say) contained a mix of both the varieties and were absolutely delicious, super taste bud liveners for morning. Although I'd like to give my cooking skills the credit, by and large it was down to the fantastic quality of the chorizo. Fiery yes but there was a real depth of flavour and richness, a little bit more than smoke and paprika. 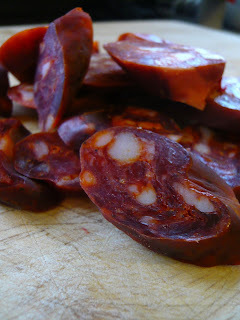 I can't put my finger on it but in comparison to some chorizo bought in supermarkets here, to be later reduced to lumps of chewy plastic in paellas and the like, the Orce chorizo was definitely of a higher caliber and cooked up a treat. But just as I type that, I have just realised that I've made of bit of a faux pas. I didn't sample any the chorizo untouched, plain and simple. I suspect that's what I should have done with the Orce Fire. *Reads Iain's note* This one has been well cured and to be sampled with a cold beer. Oops. Well, you're just going to have to send some more over then. And then I'll forget about the dental work. Love - LOVE Chorizo....although I have to admit I lurch wildly in my pronounciation from chorITso to ChorEEzo....it depends on atmospheric conditions I think. Especially loving the look of the chorizo and scrambled egg dish Dan - lovely looking plate of food. Oh - and well done again for winning the Bisol food matching competition. I'm not bitter....much. Very interesting post! Thanks for the link to ocre hams - great pics too! Loving your bizaare daydreams. Makes me feel less alone coz they're the kind of dreams I have! 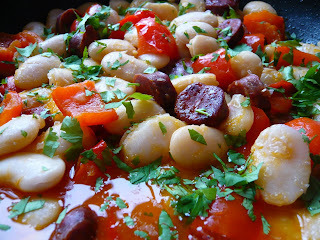 Chorizo sounds / looks fab! The poached egg picture made me all tingly. Talking of which, stop sniffing Tippex. ps well done for thrashing Dan at the Bisol cook-off. Did he have to bow to you? Brilliant post Dan and great looking food. Well done for doing something special with it all. Oh, i just know what you mean about the choriz(th? )o dreams - they can lead your brain into all sorts of strange caverns and grottos. 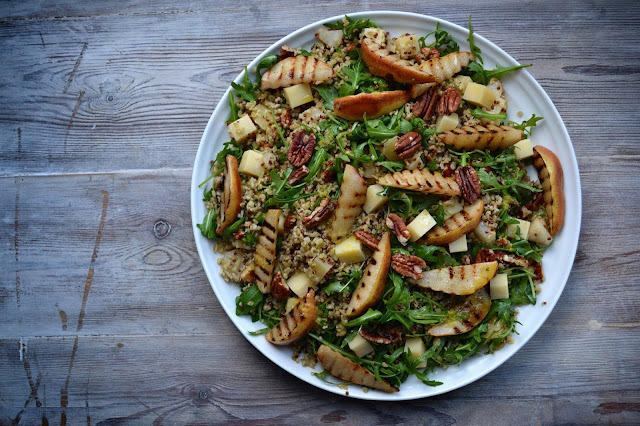 Great looking and sounding food, am feeling just a teensy weensy bit envious right now. Mainly because my chorizo supply has run completely out. 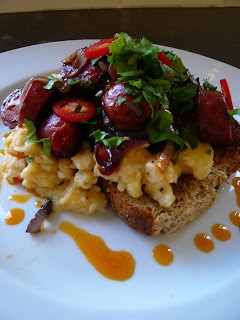 Chorizo and scrambled eggs sounds like heaven! gosh! this all looks a bit lovely. And well done on winning the bisol competition, you big clever you. It all looks amazing, good Chorizo it pretty special any way you do it but I'll definitely be trying the scrambled eggs.